Money can buy you a house but cannot buy a home, can buy you luxuries, but not happiness, can buy you a bed but not sleep… there are hundreds of quotes quotes translating to the same thing. But who has made these quotes? How many of them have made these quotes when they had no money? Most of the people who own these quotes are rich or probably did not have it easy but have money now. This makes me think for the majority of the population. Can having no money take our happiness away? Hell, yes. What does having no money can mean for most of the world’s population? Multiple sacrifices – you cannot purchase the same grocery products you have been used to. Imagine our children missing out on that hot chocolate or coffee. One’s child suddenly forced to give up on a promised & confirmed education, having worked hard for years to get into that university/country. Heartbreaking. Compromising for cheaper alternatives and lower quality products. Frustration due to a limited number of jobs for graduates with no experience. A chicken and egg problem – if only there is an opportunity to gain experience. In bad market conditions or an employer’s market, professionals are hired for a graduate’s salary. What drives experienced professionals to work for a graduate salary is a lack of money. A depressing environment along with personal depression, at times with the loss of so-called friends. A sudden change in lifestyle and being looked down upon, implied authority taken by a few to look down upon you. All of the above are bound to take our happiness away, and the one common factor that is responsible is losing income. The university you dreamed of and cannot attend now due to the sudden job loss of your parents or giving up on an education that you have already started. Cannot pursue a career of your choice due to not having the luxury of time to wait for that job in the field of your choice. End up doing a job that brings unhappiness. Lack of money may force you to move out of the location you grew up in and part ways with friends. Reaching financial independence is more or less unachievable for many, since our wants usually go up with the increase in income – we may want a better car, more expensive branded bag/shoes, a bigger, more luxurious house, shifting from a regular sofa to a recliner, upgrading from regular chocolate to luxury chocolate…. 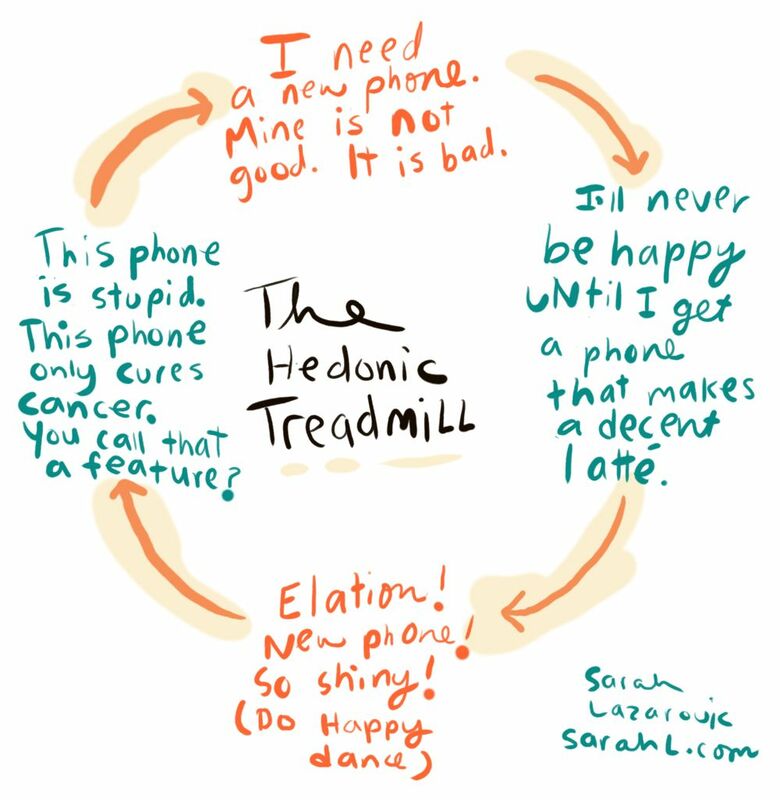 Be careful, do not get into this trap and rat race called hedonic treadmill where you think a little more money can make you happy, but when you get more money, there is something else we want to get. We will fall into a bigger trap addressed as ‘interim cases’ above if our increased wealth brings increased demands and an unfortunate event of losing a job can get ours and our families lives to a standstill forcing a need to sell what you have thereby losing the value of your money. The key is to save early on in life and not fall into the trap of hedonic treadmill. A home with no money or limited money is almost like a home in mourning. Money is needed at every step of our lives, to eat, cover ourselves, for shelter, basic privileges, and comforts etc. Although wealth is not linked to happiness for the rich, in my view, it is highly linked to unhappiness for the ones who do not have it. If you speak to children of wealthy parents, you may hear them getting frustrated when speaking of anything linked to money – perhaps not appreciating what they have in terms of exposure, visibility, education, that internship, luxuries, lifestyle etc. What they would remember is not having enough family time because their parents were busy making money thereby not having time for themselves or their families or vacations. People with money may not have the time to spend the money they have but know at the back of their mind that they can buy all things money can buy. They may have the option of stepping down from high flying positions and settle for less rather than get stuck in a prison without walls thereby improving family bonding and personal happiness – this happiness is not dependent on having more money but just knowing what is enough. Death in families, irrecoverable illnesses, losing a loved one, being betrayed or cheated, discontent with life, unhappy family, finding real friends – Money cannot solve any of these irrespective of one’s financial position, and these concerns can happen to anyone, rich or poor. Of course, when a wealthy person faces this, it is easy to say money can’t buy happiness, but a poor man has no choice; he has many bigger problems impacting his happiness that lack of money is responsible for. To conclude, there is no real relationship between happiness and money for the rich, but money is critical for most, where money can bring a lot of happiness. Finally, for those who say money does not bring happiness, they may want to transfer that money to those whose happiness is just taken away due to the lack of it. If you’re low on $$$, here are a few ways or part-time jobs to make extra cash in UAE [click]. What will advertising sound like in the future? I do agree 100% with the above. I convey similar thoughts to my kids! !